Yesterday’s weather was violent. The day started off hot and humid with the sun pounding down through clear blue skies and not a breeze to be found. The weather service warned we might get strong thunderstorms. Turns out they were right for once. By midday clouds moved in. Thunder growled far away, just at the limits of aural perception. Soon a line of storms hit us, one after the other, with respites of twenty to thirty minutes of sun between. The first two storms were not so bad. A few rumbles of thunder in the distance and smatterings of rain. Storm three was a different matter. As it came overhead, everything grew very dark. The lightning strikes were much closer. Gusting wind threw heavy rain against the windows. Then loud pings began to sound on the metal roof. 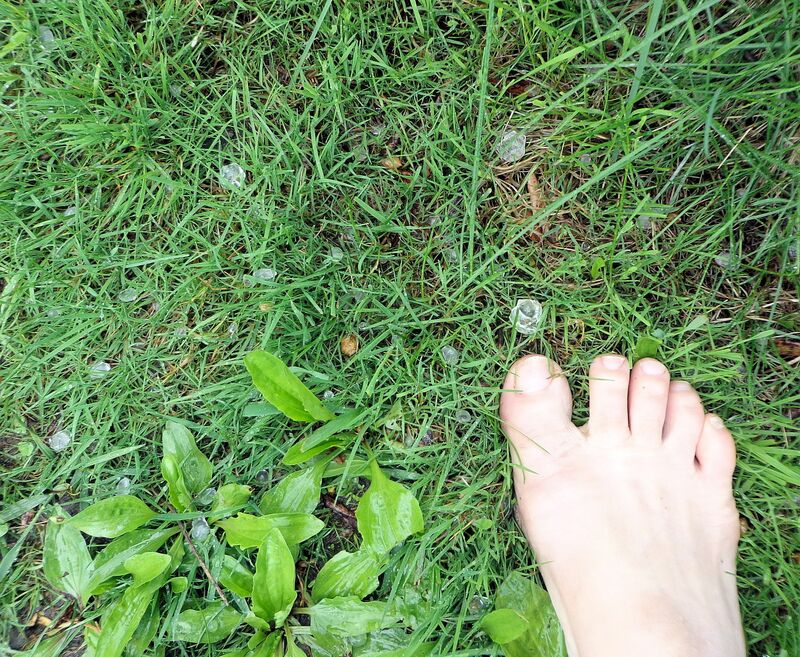 I looked out to see hail, some the diameter of quarters, dropping all around. I rushed into the pouring rain, lightning and hail to rescue my tomato and pepper seedlings and to turn my fig tree so its leaves would be sheltered from the ice chunks. It hurts when large bits of ice hit you at a good velocity! The hail kept on for ten minutes, mixed in with heavy rain. I was so glad to have not planted my garden yet. The tiny plants would have been devastated. 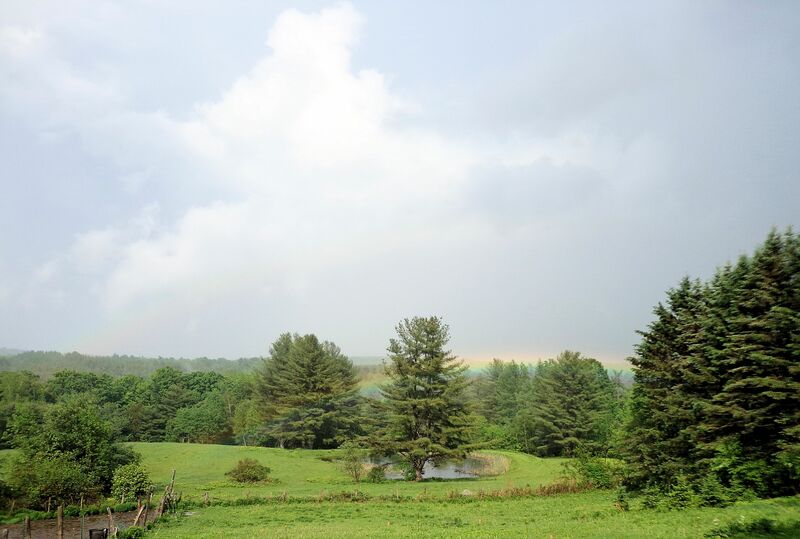 After the hail storm passed, the sun came out as it continued to rain, making a lovely double rainbow over our farm. Storm number four was even darker, with high winds and the hardest rain yet. The power flickered three times from lightning strikes. The animals quailed in terror. All three cats stayed by my side and I had to settle the poor dogs. Finally, the last storm moved away. I watched its dark malevolence close in on the city of Waterville, seven miles south of us. This morning’s local paper has photos of flooded streets and downed trees in Waterville, damage wrought by that last storm, I’m sure. A good portion of the city lost power for several hours. The band of storms we had yesterday are the sort that sometimes spawn small tornadoes. There were no reports of twisters. The straight winds were more than sufficient to uproot tees and even tear the roof off a building to the south of us. 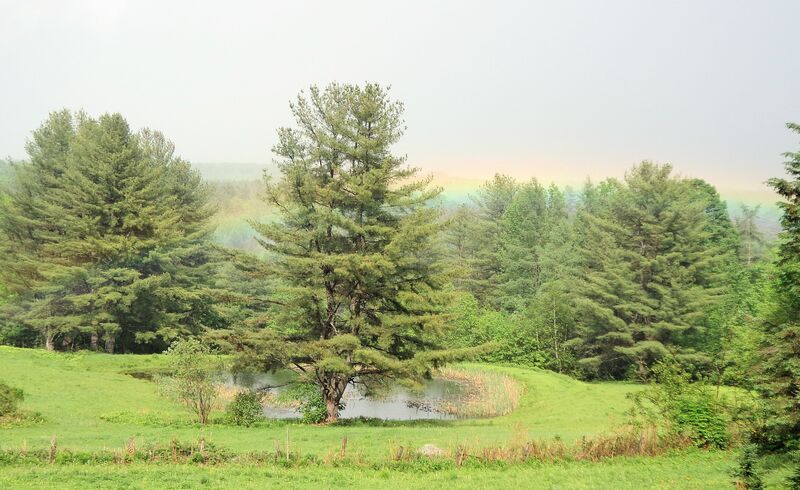 The story is the rainbow symbolizes peace between deity and mankind, a promise that no storms will ever again rise up like the ones fabled to have flooded the entire earth. For me, rainbows are a reminder that although Earth’s weather is usually benign, there are times when the turbulent atmosphere becomes dangerous and threatens all we hold dear. Strange occurrences are possible in the most mundane settings. Here at the house on our farm we have had more than our share of odd and inexplicable events over the years. When I was young, perhaps thirteen or so, my family lived in a mobile home that was set on the same space our house now occupies. The trailer was lost in a fire in 1985. My room was at the farthest northern end of the old mobile home. Very late one night, I believe it was in November, I was having trouble getting to sleep. Everyone else in my family was sound asleep, yet I just couldn’t seem to settle my brain. I lay there and listened to a strong wind howling around the corners of the house and through the bare limbs of the tall trees outside. Suddenly, just outside my window, I heard a child calling. The voice said “Mama….mama,” several times. The sound had a profound quality of loneliness, grief and fear. I recall it as the saddest sound I’ve ever heard. I knew there should be no one outside our house at such an hour. We lived in a very rural area with no other homes nearby. In such situations we sometimes grasp at unlikely solutions to problems that can not be explained. I thought perhaps one of my younger brothers was somehow outside, although I knew they were both asleep in the bunkbeds in their room. Just to satisfy my concerns, I got up and checked my brothers. They were, indeed, asleep in their beds. Their room was located in a part of the house well away from me. It was not the sound of a boy talking in his sleep that I had heard. Puzzled, and not at all interested in looking outside in the dark for lost children, I went back to bed. Within a couple minutes, I heard my mother come out of her room at the other end of the trailer, a good sixty feet from me. I listened to her go to my brothers’ room and open the door. It seemed odd, but I stopped puzzling over it and finally fell asleep. In the morning I asked my mom why she had come out of her room the night before. She said she thought she heard one of my brothers calling her from outside the house and went to check that they were both in their beds. I told her about what I had experienced and neither of us knew what to make of it. As the years passed, bringing a fire to destroy the trailer and the subsequent construction of a new house, it happened that a northwest corner room of our home was built over the site where I heard the child’s voice. Part of the room is below grade-level with one wall set into the ground similar to a basement and the floor is poured concrete. There are three rooms along that wall of the house that are made the same way. The entire house sits on ledge. Of all the rooms in the house, that one is always unusually chilly. One corner is so cold that water will condense on the floor during the heat of summer if we don’t run a dehumidifier. The other two similar rooms do not have that problem. People have suggested there might be an underground spring in that spot. When we did the excavation work to pour the foundation and floor of our current home, we hit solid rock and no water. Our drinking well is about twenty-five feet from that room and it was drilled 300 feet deep before water was struck. I am not convinced a spring exists there. I suspect someone was lost in that space. Some small child, perhaps? The road we live beside was undoubtedly a trail for the natives during pre-European times and slowly was turned into a modern route. It has existed as a link between towns for at least three hundred years. Who knows what sorts of deaths could have happened here? Three hundred feet south of our home is a cemetery so old it has no headstones or town records to identify the occupants. In our own time at the farm, there have been three deaths along the mile or so of road near us. Deaths on this road are fairly common. One woman passed away in a car accident just one-hundred-fifty feet from our home. Or something else might have happened to claim a child’s life. The land we live on has been farmed for over two hundred years. I honestly believe the voice my mother and I heard was not of this earth. With this history in mind, I’d like to present some of the other strange experiences we have had in this house. My husband, two-year-old daughter and I moved into our home in 1988. We have just the one child. Her first room, until she was a young teenager, was right beside ours. Our bedroom was the chilly room I discussed. Many times growing up she would complain to me that she felt like she was being watched in her room. I always told her not to worry, just her imagination. One day, when she was ten or eleven, she was alone in the house. Her dad was out in the yard washing the car. I was in the barn tending to rabbits. As she tells it, she decided to take a shower. After getting cleaned up, she wrapped the towel around herself and went in her room. At that time we were still constructing the house and the “door” to her room was a set of long, thick curtains, the type used to insulate sliding glass patio doors. She said as she was getting dried off, suddenly the curtains flew apart as though hands had pulled them open, a voice said “Rarr!” and then the curtains closed again. The first I knew of it was when she came wide-eyed and terrified into the barn and asked me if dad or I had come in the house. I knew we had not. She had been alone in the building. This happened just a few months after my father passed. Maybe my dad was making his presence known. He was always fond of playing tricks on children. At least, I hope that’s who it was. On several occasions over the years, I have been using a particular tool or piece of equipment to work on a construction or repair job around the house when the tool will disappear for a time. I will search in a most annoyed fashion for the item that I knew I had just set down, but will not find it. After I turn away to do something else, and then turn back again, there the tool will be, right where I’ve already looked. Very aggravating. Around the time of the curtain incident with my daughter, I had purchased a ring of which I was especially fond. It is pictured in the photo above. A simple sterling band set with five large dark red garnets. Not a terribly expensive piece, just pretty and beloved by me. I was going away on a two-week trip to England with my daughter and decided to leave the ring home. I opened the drawer of my bedside stand and placed the ring on top of a small wood jewelry box, where it was easy to see. This happened when our bedroom was still the chilly, downstairs room. When we returned from England, I opened the drawer and the ring was gone. The only person who had been in the house for that two weeks was my husband. He knew nothing about the ring and had not opened my drawer. I searched everywhere for that ring. For days and days I hunted, although I knew exactly where I’d put it. Finally, I gave up. About a year later, I opened the drawer one day and there was the ring, right where I’d left it! I had opened that drawer at least once a week for the whole year to get other jewelry and the ring was not there. About when the ring went away, an important document that was left on the dining table also disappeared. We never found the paperwork again and had to get it duplicated. We could never devise an explanation for how the papers went missing. After our daughter grew up and left, the house seemed to become more calm. Perhaps her boundless youthful energy helped to power whatever was bothering us. It has been mostly quiet for several years. The oddest thing I have noticed is that sometimes when I go into our new bedroom upstairs I will catch a faint smell of cigarette smoke. No one in our household smokes in or around the home. I encounter this smell when the room has been closed up, so it is not wafting in on a breeze from the neighbors or from a car passing by on the highway. It seems odd, but not too troubling. Then, starting three years ago, I began watching our granddaughter one day every week. About one year ago, I had Lia, the granddaughter, for the day. My brother was also visiting. He had just driven up from NYC the night before and had slept upstairs in a room on the other side of the house from our bedroom. He was still sleeping around eight in the morning when I took Lia outside with me to do barn chores. As we came in the house at 9:30, I heard the far-away sound of an alarm going off. My brother had woken and was sitting at the table having coffee. I left Lia with him and followed the sound upstairs to investigate. The little battery-powered alarm clock in our bedroom was going off. It was set to exactly 9:00. I know the clock was at the correct time when I’d glanced at it that morning at 6:30. The clock keeps very good time. It would not have lost a half-hour, especially that quickly. Somehow the hands had been turned back one-half hour, the alarm hand had been moved from its customary 5:00 setting to 9:00 and the button had been slid up to activate the alarm. 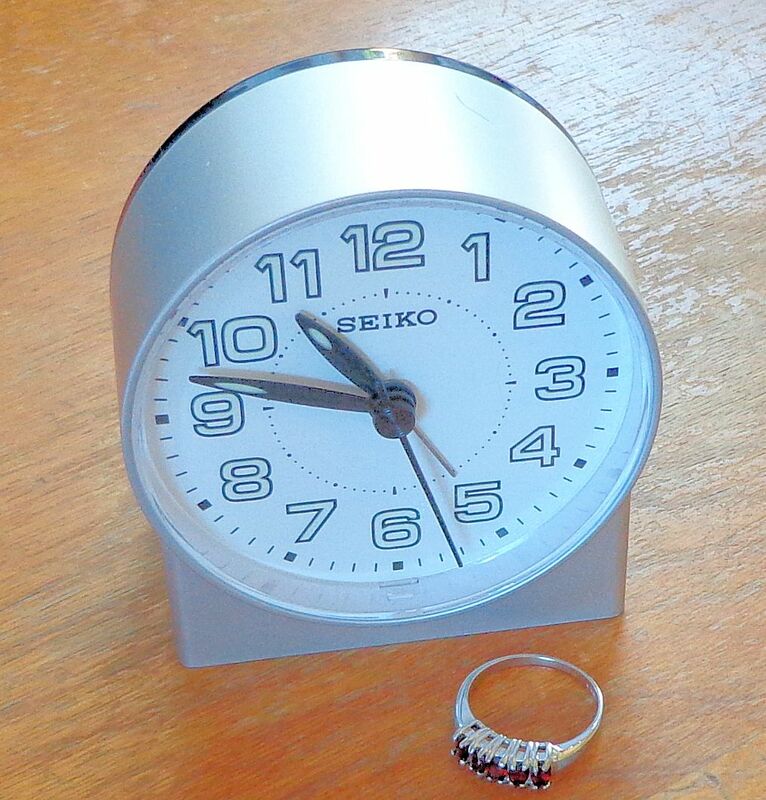 The clock in question is pictured above. I shut off the alarm by pushing the button down, then went downstairs and asked my brother why he was messing with our clock. He looked at me like I had two heads. To this day, he swears he didn’t go in our room, let alone touch the clock. He was the only one in the house, the only human who could have reset the alarm. Since the clock incident, there has been one problem with not being able to find something I had just been using, and once when I’ve smelled the smoke, but there have been no other strange instances. Just my luck, writing about it will trigger trouble. Knock on wood! Here at the farm we have a fancy pair of lawn mowers. They are grass powered and self-propelled. They do an excellent job, with a clean, close cut. Steep hillsides are trimmed with ease. Edging is a breeze. They even provide some fresh fertilizer from time to time! 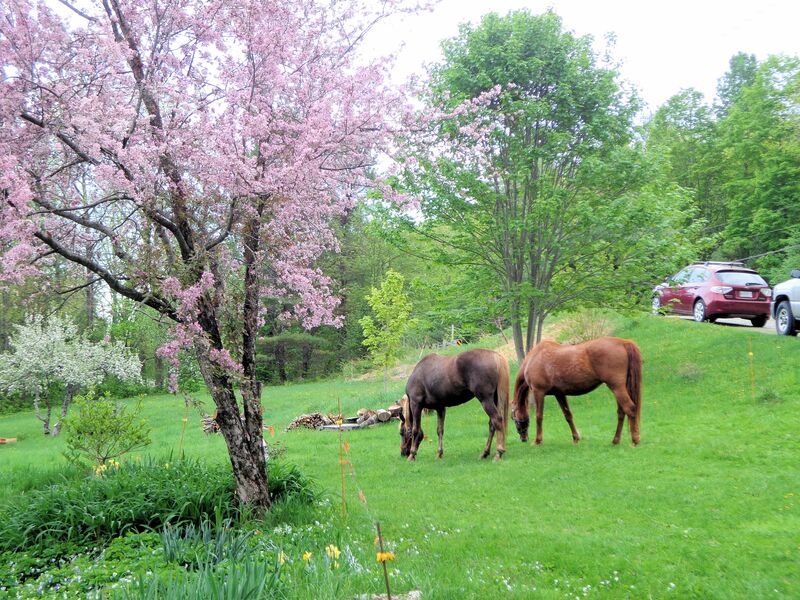 In the spring the horses need fresh grass and we need to keep ahead of the rapidly growing lawn grass. Horse lawn mowers work out very well for us. The fence is not even electrified. The horses are so trained to the fence they stay inside. Sometimes they get excited and prance around a bit, tearing the ground with their hooves. The damage is minimal and quickly repaired. 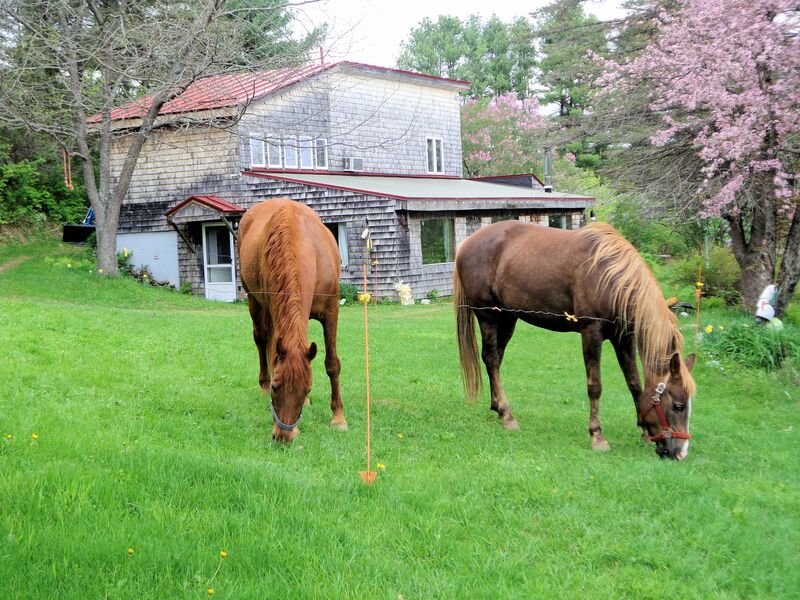 Our four-legged lawn mowers are tireless and always eager for work. 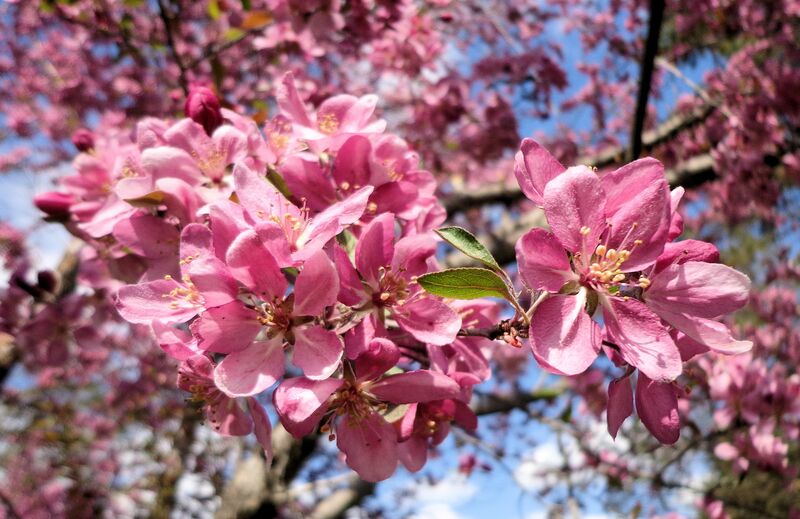 The pink flowering crabapple tree is gorgeous! Like a huge bouquet of fragrant blooms. Last year it had no flowers at all. 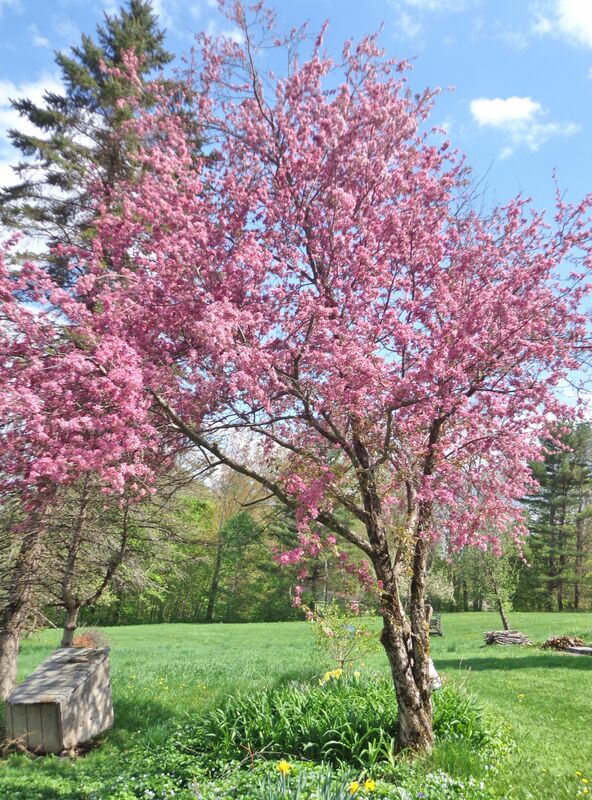 I suspect the winter was too cold because the forsythia and the dogwood didn’t bloom last year either. I wish everyone could stand beside this tree. The scent is reminiscent of grape soda. On a sunny day the whole yard is filled with its aroma. 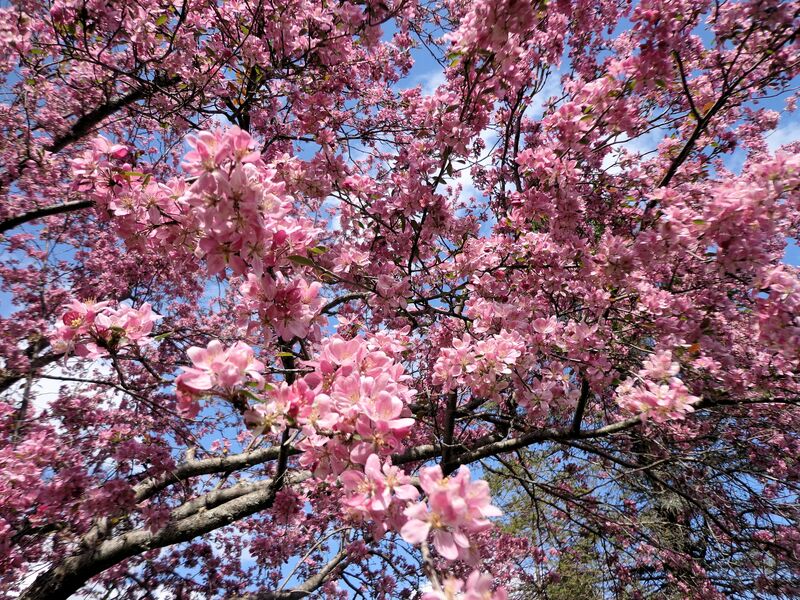 The bees go crazy for the flowers, buzzing amid the petals in the hundreds. Butterflies and hummingbirds also visit the crab tree. I planted a companion for this tree, just a three-foot tall single stemmed whip right now. But, it is getting leaves and if all goes well, one day it will join the other in an intoxicating spring show. 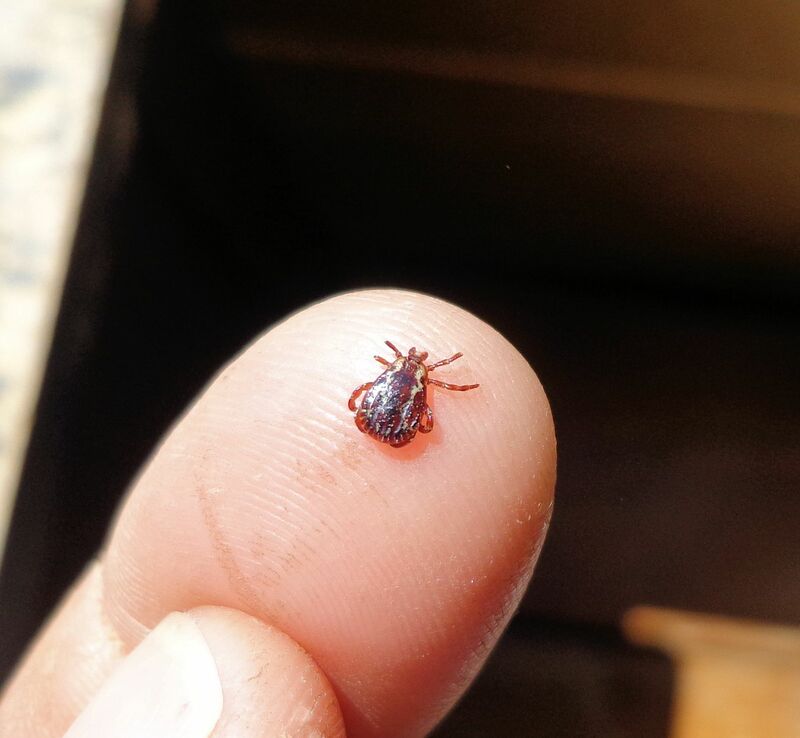 Since the middle of April I have found a total of seven of these nasty little ticks on me. I get them working out in the orchards, where the deer go, although they do not look like deer ticks to me. They are about the same size as an adult deer tick, but do not have the abdominal band of that species. I believe it is a dog tick. Luckily, none have attached so far. Every night I do a tick check, searching all my body for the critters. Most of the ticks I’ve found have been felt as they crawl up my arm, or one, up the middle of my back. Ticks tend to climb to the highest point on a body to look for a place to attach. I feel them most often on my neck. Since the beginning of tick season, I’ve learned not to ignore any little tickle that might be tiny insect feet. Sometimes it feels like my skin is crawling even when there are no ticks around. Just thinking about it makes me twitch! Lyme disease is a serious problem here in Maine. Many dogs are stricken with the bacterial infection, as are horses and, far too often, humans. There is a fairly new tick borne disease called Relapsing Fever that is also caused by a bacteria. I’m pretty certain I got that three years ago. First, I found two tiny nymph ticks, one attached to the back of each of my knees. They were the size of poppy seeds. Soon after, I suffered from high fevers, nausea, bad headaches, general weakness and malaise and overwhelming fatigue in bouts that recurred every few months. I had no idea what was wrong with me for over a year. Luckily, I finally read about Relapsing Fever and got a course of doxycycline antibiotics. It has now been fourteen months and the illness has not returned. Ticks also carry anaplasmosis, a Lyme-like bacterial infection affecting dogs and humans, and Rocky Mountain Spotted Fever. While I worked as a vet tech, I saw dogs so sick with Lyme that they were unable to move. The acute symptoms make dog joints so painful the animal gives up, refuses to stand and won’t eat. The effects of antibiotic treatment are amazing. After just a few days, the dog is feeling better, active and eating again. Dogs need a month-long course of doxycycline to clear Lyme infection. Sometimes it takes more than one course. Untreated Lyme can even kill by causing kidney failure. Doxycycline is our best defense against this crippling illness. I shudder to think what would happen if the Lyme bacteria develop resistance to doxycycline. 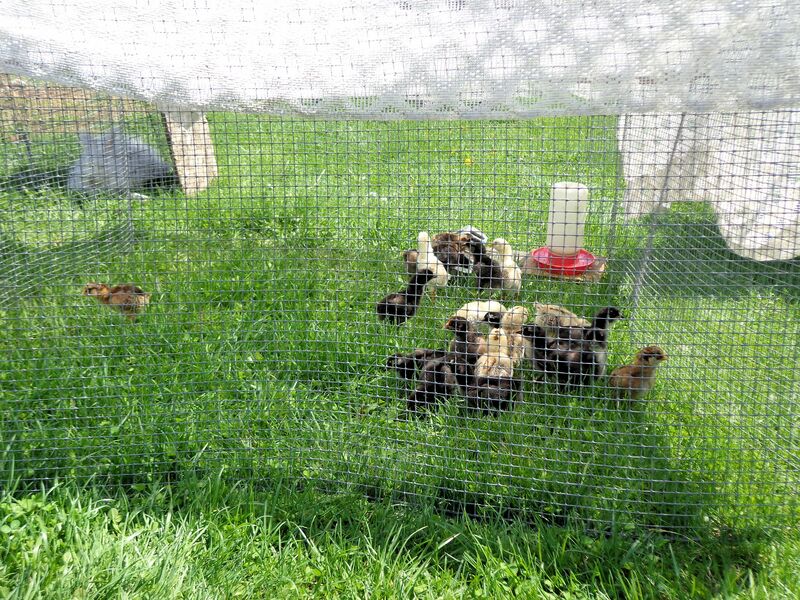 Yesterday the baby Ameraucana chicks left the brooder boxes in our upstairs bathroom and went out into the big world. 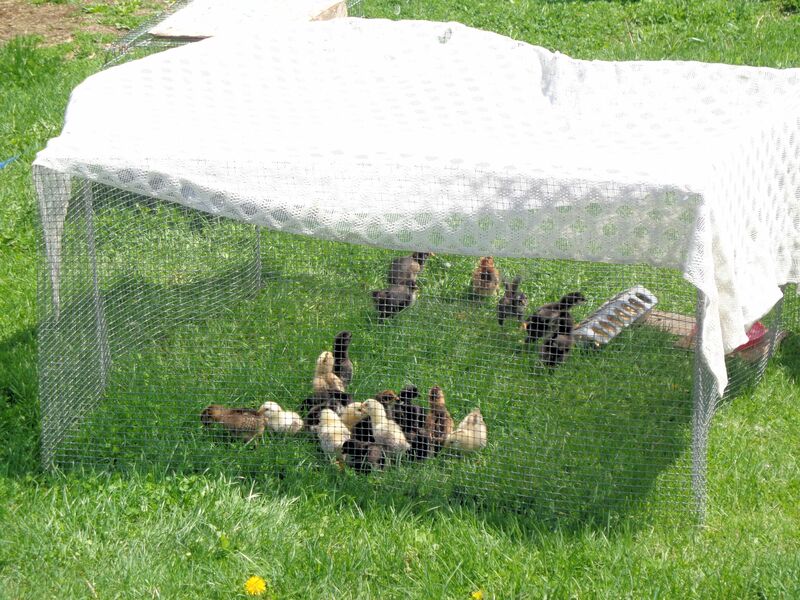 I set up a nine square foot pen for them on the lawn so they could enjoy the warm, sunny day and the fresh grass. 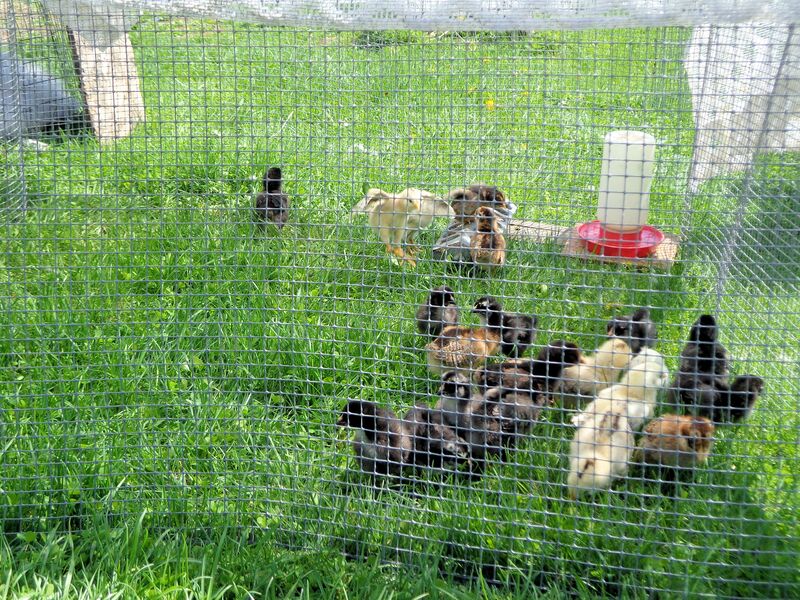 When the babies first landed on the grass and had a glimpse at the immensity of what lay beyond the cardboard walls they had known since hatching, they were stunned. They hunkered together in a bunch, not saying a peep, just staring. One little rooster lay exactly where he landed with both wings spread wide, not daring to move. I had to coax him over to his siblings. 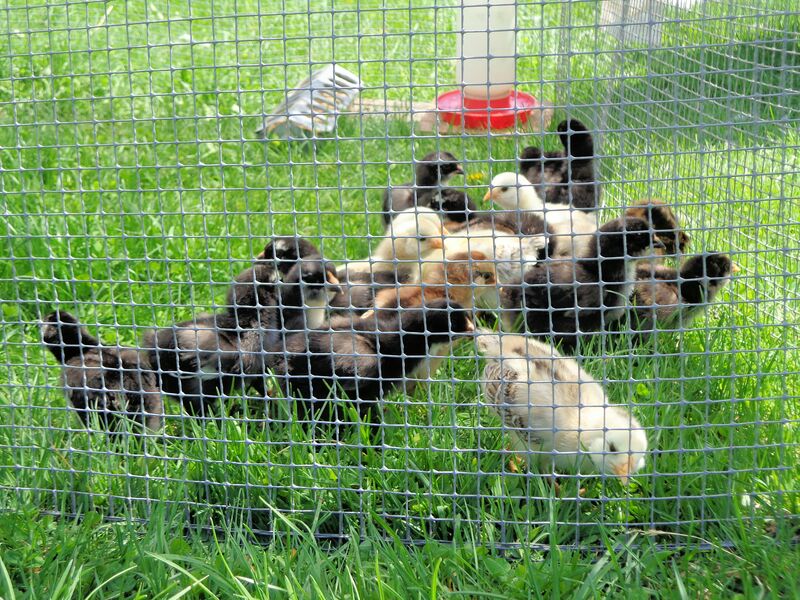 Some encouraging clucks from mother hen (me) and a few minutes spent watching for predators gave the little chicks enough assurance to begin exploring. Soon they were eating snips of grass, scratching at the ground, and one even found a bug. It ran around peeping loudly with the catch in its beak and several chicks following to see what the excitement was about. A benevolent white bunny watched from a nearby cage. Soon the freedom became intoxicating and chicks started to spread their wings. They flew about the enclosure. This is a sign they have become comfortable with the surroundings. Everyone had a good look around, then a bite of chick food and a drink. The sun was so warm and inviting that soon it was naptime. All twenty-one little birds spread out in a patch of sunshine for a good sleep. Afterward, the babies took up their new residence in the barn. 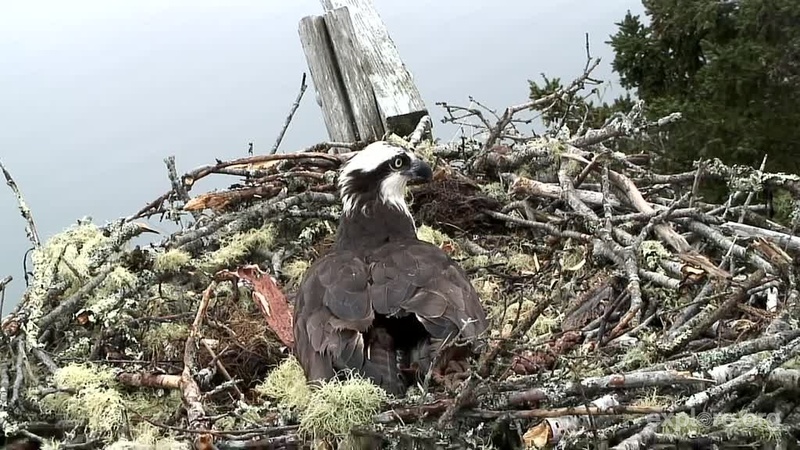 Here is a snapshot I took this morning off the live cam of an osprey nest on Hog Island in Maine. Yesterday I watched two ospreys fly over our farm. I have never seen these birds in our area although there is an established nest about seven miles from us near the Kennebec River in Benton. It was the loud, seabird-like call that first got my attention. Ospreys are very large birds that form a distinctive M shape with their wings as they fly. The pair I watched soared with the thermals over our farm for about ten minutes before sliding off below the horizon. They made a lot of noise as they flew. Ospreys were nearly wiped out in New England by the use of DDT. The insecticide got into the food chain and concentrated in the bodies of the big predators at the top of the chain such as the hawks and eagles. DDT causes egg shells to thin to such a degree that they crack during incubation. The birds are unable to reproduce. Since the banning of DDT in the US, osprey and bald eagle populations have made a comeback. It is no longer as rare to spot these birds, especially bald eagles. Ospreys incubate their eggs for 40 days with the pair sharing incubation duty, although the male tends to do more food bringing to the female on the nest. 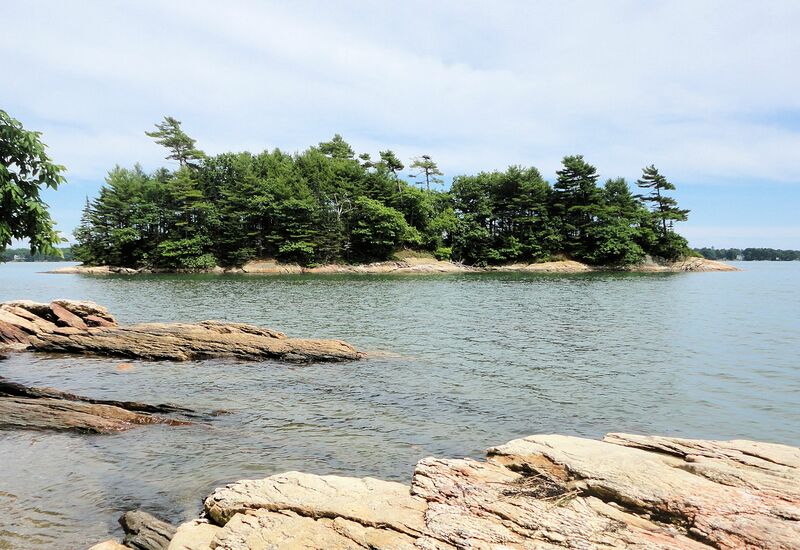 There is also a nice osprey nest to watch on Osprey Island at Wolf Neck Woods State Park here in Maine. Here is a shot I took last year of the island. The nest is at the top of the scraggly pine near the center of the island. The recording is in the link below the silhouette of a hawk, right where it says “typical voice.” Or click on the “Sounds” tab to hear various calls. Caution–watching the ospreys can become addicting! This entry was posted on May 12, 2015, in Wild Animals and tagged fish eagle, hawks, Maine birds, osprey, ospreys, wild birds.